I'm not going to pretend that pensions are in any way exciting but some form of retirement income is essential. I worked in the pensions industry for many years and often came across people who were completely unprepared for surviving retirement in the manner that were accustomed to whilst they had been working. So take five minutes and read through my tips for getting the most out of your personal pensions – it may just change the rest of your life! Personal pension or occupational pension? - If you work or have worked for a company and have been enrolled in their pension scheme it is most likely an occupational pension scheme. These work differently to personal pension schemes. However, some companies (usually small ones) operate Group Personal Pension (GPP) schemes which both the employee and employer contribute to and the employer usually takes the pension contributions directly from your salary and passes them on to be invested. If you leave the company the personal pension is yours to take with and to keep contributing to. Have a look through your paperwork to see that type of scheme you are a member of. If you have been self-employed and paying into a pension fund it is most likely a simple personal pension plan. Don't rely on the state pension – If you've stopped paying into your personal pension plan because you think your state pension will be sufficient think again. Fewer than half of the people who retire under the new state pension due in 2016 will receive the full weekly payment of around £150. From next April as well the state pension age will increase to 67 from 2026. There is no early retirement with the state pension. If you want to know an estimate of what your state pension will be ask for a forecast. What will I need to pay for? - Think about the costs you will have to pay such as any outstanding mortgage payments or a monthly rent. There's also the bills you can't escape from such as council tax, water, gas, electricity and food. If you like going on nice holidays, meals out or have an expensive hobby then these will need to be paid for so think now about contributing more to your pension fund. 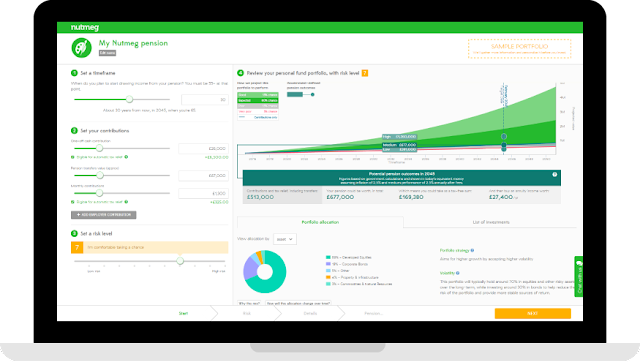 Use a retirement calculator to work out how much income you will need. Keep a track of your pensions – It's easy to forget about your different pensions. You change jobs, move house, start and finish relationships and before you know it you have drawer full of paperwork from companies that no longer seem to exist. Make a list of where you have worked and the companies that you remember having pensions with. If you don't have a recent statement from them and their contact details are unobtainable try a pensions tracing service. Consolidate your pensions – I would never recommend transferring an occupational defined benefit or final salary scheme pension to a personal pension but it may be worth putting all your personal pensions together. Look for a pension company like Nutmeg that charges low management fees and has range of globally diverse investment options. They also have no set-up charges, exit penalties, or commission fees when they trade on your behalf. Gone are days of waiting for an out-of-date annual statement as now you can log in to your own personal dashboard at any time. Pension v other investments – The main benefit of personal pensions is that your contributions attract tax relief at at least 25%. Essentially that is free money! If you're a higher tax payer then you can claim more tax relief through your self assessment form. Since you can't access pension funds until you are at least 55 it ensures your future income is locked away and you're not tempted to spend it on something else. Review your risk strategy – I know many people when they first take out a personal pension plan are tempted by figures showing high investment performance. In the long term this may reap rewards but usually such returns can be mean high risk. If you're nearing retirement or you are now more risk adverse perhaps it is time to think about changing how your pension plan is invested. Alternatively your precious future income could be in an underperforming fund with years to run. Whatever you choose to do with your personal pension don't ignore the fact that one day you will need money in order to have a comfortable retirement. The later you act the poorer you could be! This is a collaborative post. I am unable to give personal financial or legal advice. Any links provided in this post should not be seen as endorsements. Other advisory sites are available. It can be such an easy thing to forget about. You can figure out how to deal with your finances day-to-day but retirement always seems so far away.